Cake cutting before Strawberry Field ground breaking. Photo: Jackie Spencer. 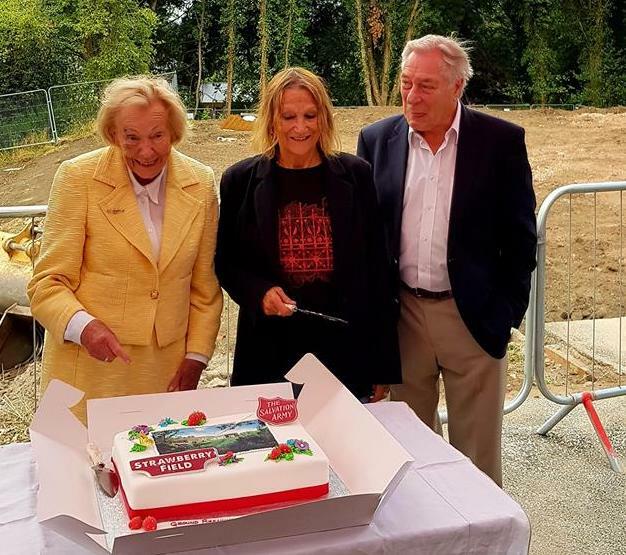 John Lennon’s sister Julia Baird and the late George Martin’s widow, Lady Martin OBE break ground for summer opening 2019. LIVERPOOL UK, TUESDAY 31 st July, 2018 – Today The Salvation Army will break ground as their vision for Strawberry Field becomes a reality and return the iconic red gates to the site. The world-famous red gates will open to the public for the very first time in summer 2019, giving visitors the chance to walk through the grounds where Lennon played as a child. A visitor attraction will tell the story of Lennon’s childhood connection with Strawberry Field and sit alongside ‘Steps to Work’, a vocational training and work placement hub for young people with learning disabilities – unique and innovative projects in one ground breaking venture that aligns community, business and tourism in the City of Liverpool. Beatles fans, supporters of Strawberry Field and the vision for young adults with learning disabilities can back the redevelopment by visiting www.strawberryfieldliverpool.com. The website includes information on how to donate to the project, as well as exclusive Strawberry Field merchandise including limited edition bricks from the original Salvation Army children’s home as well as t-shirts, mugs and much more for Beatles and Strawberry Field fans. 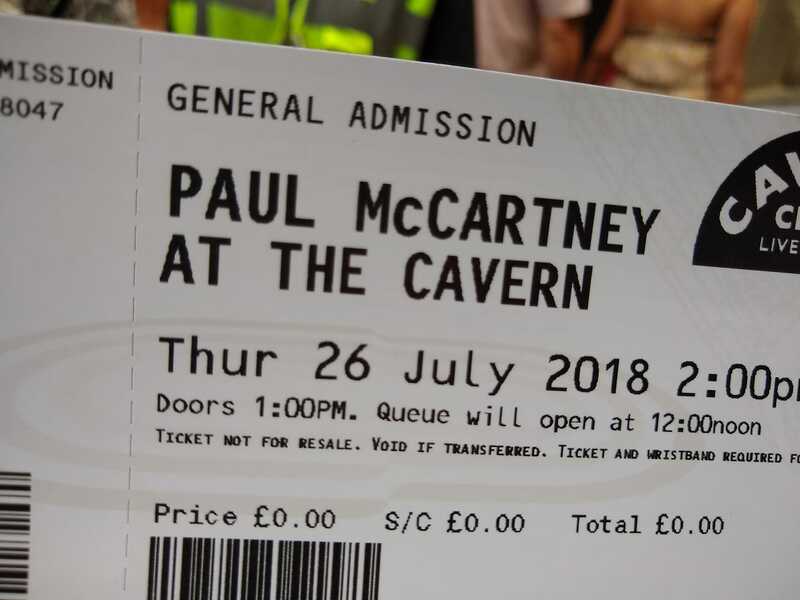 Only 200 tickets were available for free from the ticket office at the Echo Arena today for the concert at the Cavern Club, which started at 2pm. The tickets were announced a couple of hours before the event, and sold out in a flash. Lots of non-ticket-holding spectators gathered outside the club as the event was taking place inside. Paul McCartney greeted the crowd with: "Liverpool!" "Cavern!" "These are words that go together well!" and he was off. The concert started with an improvised jam between the band members, before they erupted with Eddie Cochran's "Twenty Flight Rock", a song that holds a special place in Beatles history. Legend is, this is the song Paul impressed John with knowing all the chords and lyrics to, when the two of them met at the famous Woolton Village Fete in 1957. The song was interrupted by Paul telling people to put down their smartphones. The tickets were individual, and people had to show ID, their name was printed on the ticket so they had to be there in person. There was also a wristband, and they had to show ID again upon entering to the club. These are good measures to ensure black marketeering doesn't take place, something which has plagued the Ticketmaster UK sales for McCartney's upcoming December concerts in his homeland. 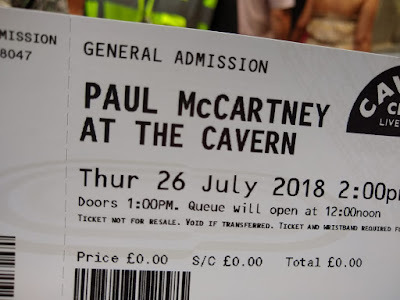 Apart from the 200 tickets that were available from Echo Arena, some nameless gust tickets were also issued - presumably to friends and family..
Paul McCartney played a lunchtime session in the Cavern Club again - after all these years. Screen capture from today's live interview from Liverpool. 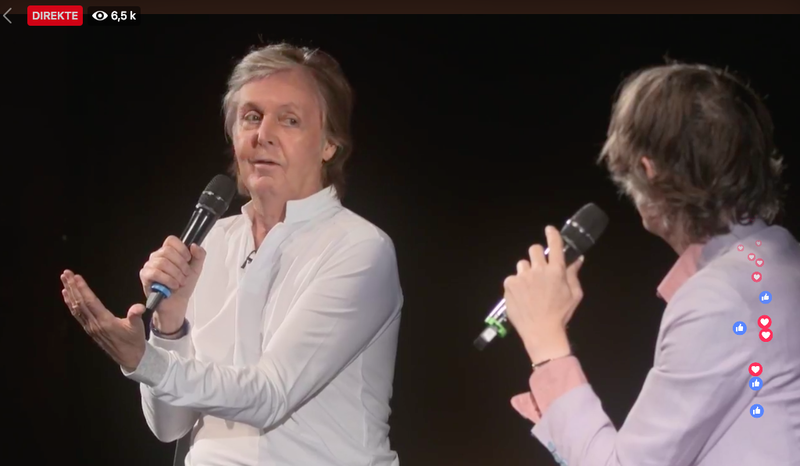 At the end of a live interview with Jarvis Cocker on Facebook today, Paul McCartney revealed that he is going to hold a secret concert "somewhere in Liverpool" tomorrow. The interview was broadcast from LIPA, Liverpool Institute for the Performing Arts - the "fame" school Paul is involved with. 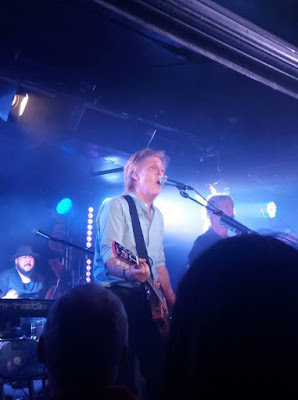 We think that perhaps the new Cavern Club may be the place in question, and Paul has played there before, back in 1999. Expect an announcement on social media an hour or so before the actual concert. Also in line for Paul is another gig at the LIPA Friday. You can see a recording of the interview on YouTube. 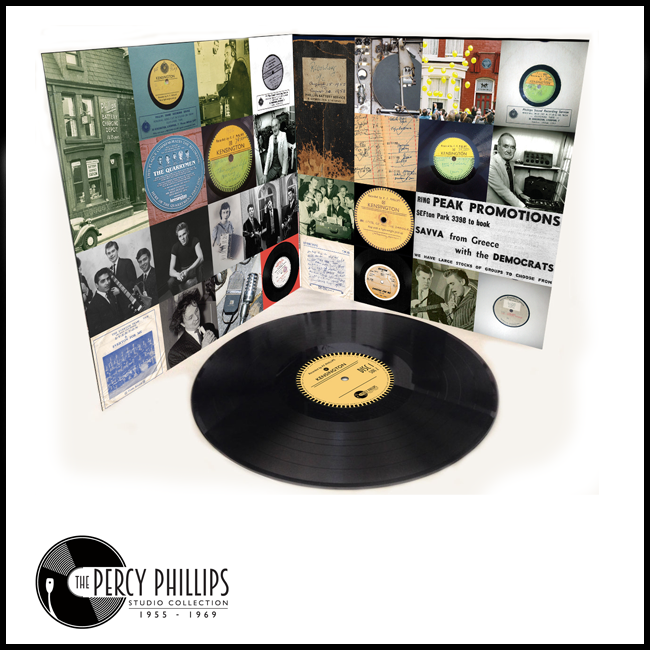 A double album of acetates recorded in Liverpool at Percy Phillips' studio will be released in August. In conjunction with the Beatle Week in Liverpool, a double album of acetates recorded at Percy Phillips' studio in Kensington will be released. The album will feature songs found on acetates from the makeshift recording studio, which was in operation in the late fifties and throughout the sixties. Among the tracks are the two titles recorded by then Quarrymen in 1958, John, Paul, George, Colin and Duff: Buddy Holly's "That'll Be The Day" and the self-penned "In Spite Of All The Danger". The two tracks were pressed on a record - the only copy in existence - and circulated within the members of the group, until pianist John "Duff" Lowe took it with him when he moved to Australia. Many years later, he gave it to Paul McCartney - reportedly for an undisclosed sum of money. McCartney pressed up copies for his friends and family, and these are occasionally for sale through various auction houses. 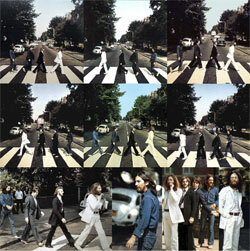 In 1995, the two songs ended up on The Beatles' "Anthology 1 " - although "In Spite of All The Danger" had been edited. One verse had been removed, reportedly due to an imperfection in the record. It has not been disclosed what the source of these two tracks on this new LP record is. It could be that John "Duff" Lowe - now back in England, performing with the new Quarrymen lineup, recorded his acetate before handing it over to Paul. The collection will also be released as a 4 CD boxed set. 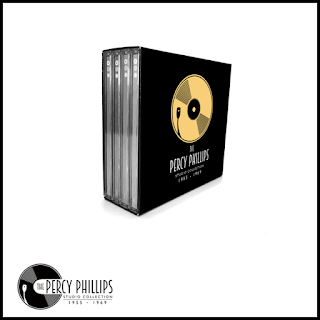 Please note that all tracks in the Percy Phillips Collection are taken from acetate discs cut by Percy Phillips between 1955 and 1969. Wherever possible the equalisation has been made to enhance the listening quality of the Collection, but purchasers must bear in mind that these recordings were not made originally for commercial release, and are predominantly of historical interest only. What bugs us is the inclusion of The Beatles' acetate of the Goffin-King song "Keep Your Hands Off My Baby", a track they recorded for the BBC, which appears on "The Beatles Live at the BBC ". Did they really make an acetate at Percy's home studio? And "Some Other Guy"? Could it really be this version? 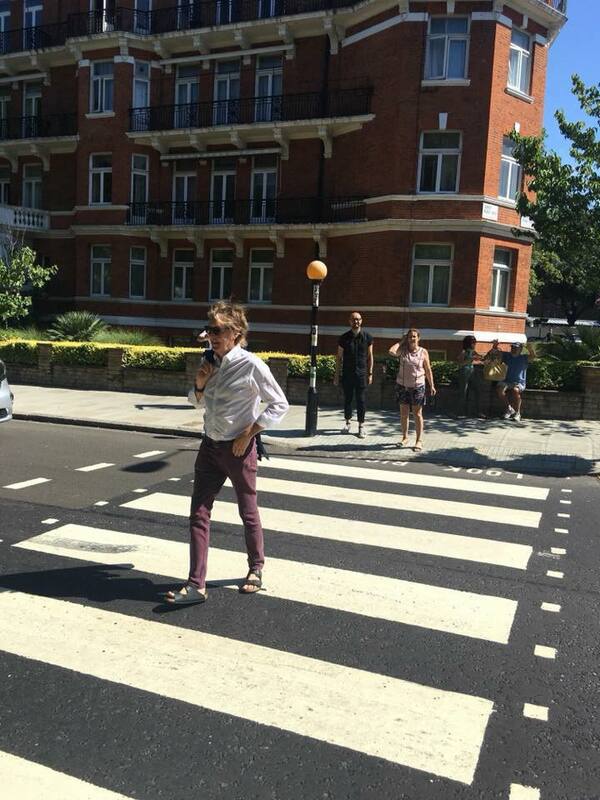 Paul wisely kept his sandals on while crossing Abbey Road today - not wanting to start anoher rumour. 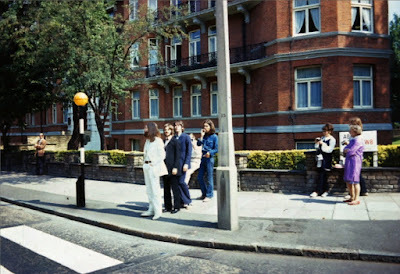 The Beatles on that same side of Abbey Road 8 August 1969. 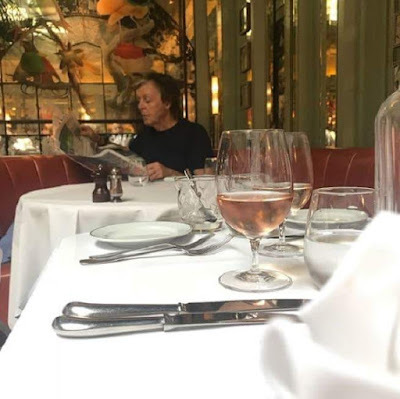 The previously mentioned "secret" event with Paul McCartney in London one could compete about invitations to - has happened. 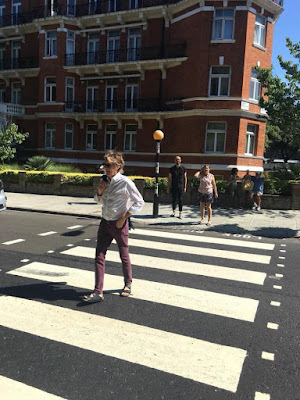 Paul McCartney, who over the weekend was pictured aboard David Geffen's yacht in Capri, Italy, arrived at 11 o'clock Monday in Abbey Road studios, after a short walk from his neighbourhood house in St. John's Wood. Paul had to walk across the Abbey Road zebra crossing twice, for the benefit of the official photographer, his daughter Mary. Paul strikes a pose for the benefit of the photographer. Mary McCartney, Paul's firstborn daughter handled the video camera, which was actually her smartphone. Outside the studio complex, camera- and sound technicians were posted at the parking lot. 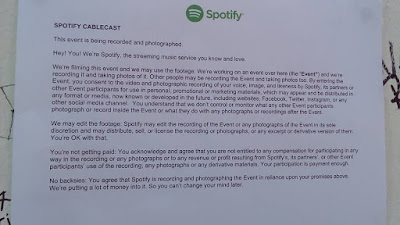 There were signs on the premises by Paul's company MPL as well as by Spotify, alerting people to the fact that audio and video recordings were taking place, and that by being present, everyone automatically granted these companies permission to use footage and recordings of them. 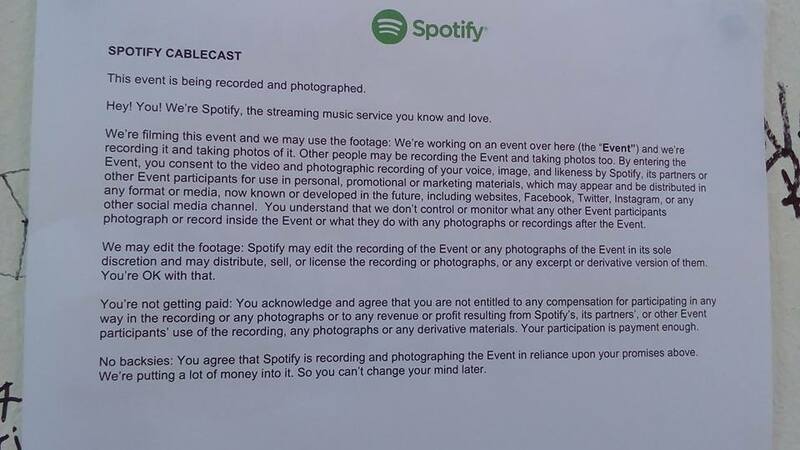 It looks as if Spotify is going to use their recordings at some future point, after editing has taken place. 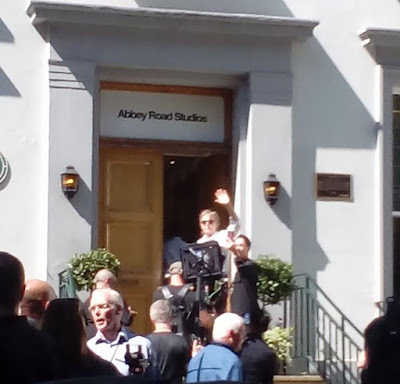 Paul McCartney held an intimate concert inside Abbey Road studios today. Inside the studio, the front rows were occupied by the winners of last week's competition, around 20 of them. The rest of the crowd may have been around 60 people, consisting of special invitees, including family, friends and celebrities like Kylie Minogue, Johnny Depp, Orlando Bloom, Liv Tyler, Nile Rodgers, etc. Here is the set list from today's McCartney concert inside Abbey Road studio number 2. Four were songs from the upcoming album, Egypt Station, plus assorted hits from yesteryear. In a tweet and on their Facebook page, Abbey Road Studios write that the concert soon will become available for us. Perhaps as a Spotify video? Leaving the studios: Nancy and Paul. This Sunday, British newspaper magazine "Sunday Times" comes in four variations, each with a different Beatles photo taken by Don McCullin at the famous "Mad day out" Beatles photo sessions. You may order the magazine(s) from yourcelebritymagazines.com at £9.99 each. After his pub concert at the Philharmonic in Liverpool earlier this summer, Paul McCartney spoke about perhaps doing more small gigs with his band in July. 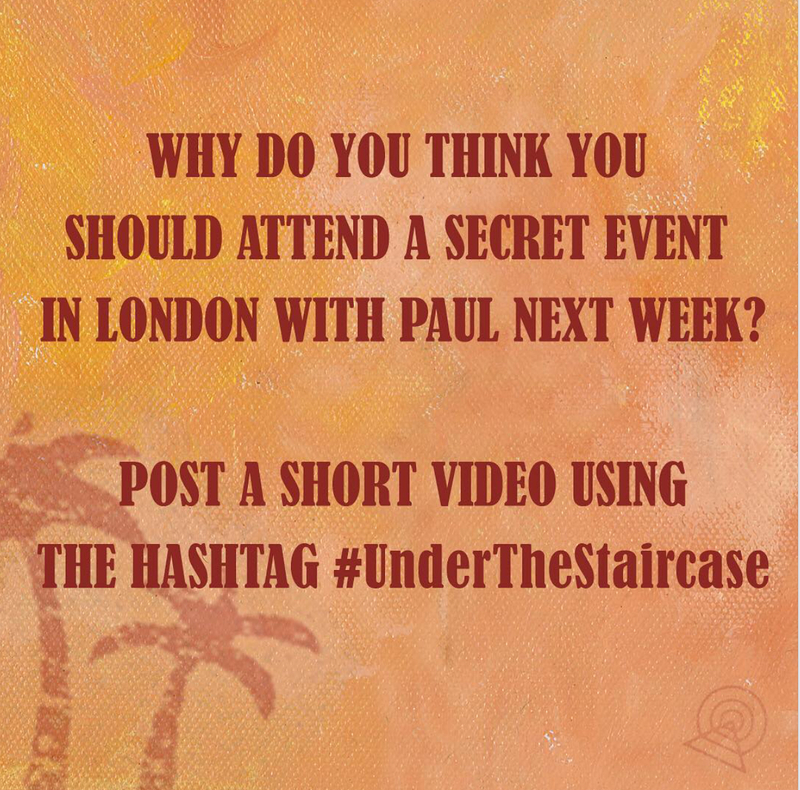 It looks like something's afoot in London next week, if we're to take his Instagram and Twitter message today seriously: "Why do you think you should attend a secret event in London with Paul next week? Post a short video using the hashtag #UnderTheStaircase". An unconfirmed rumour points to studio 2 at Abbey Road as the most likely venue. So if you're planning to be in London next week, you know what to do! In addition to these invitations, Paul also uploaded a new video to his official Vevo and YouTube channels. It's an old televised concert recording from ITV's CD:UK show, which was shown on TV in the UK on November 24, 2001. 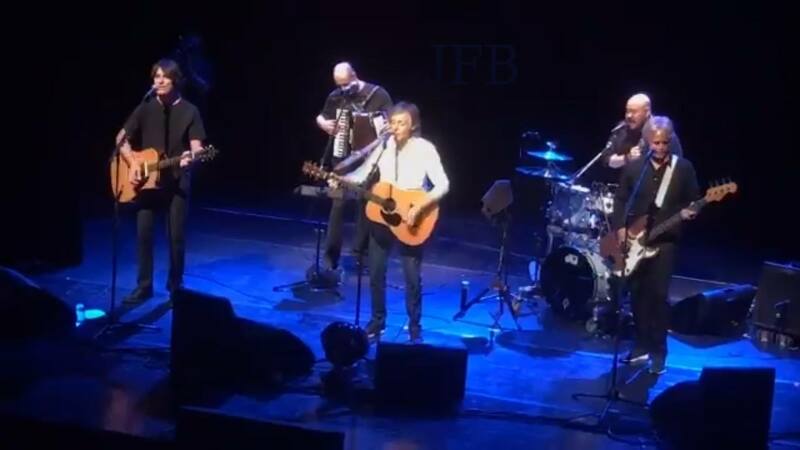 Paul performs his own song "Freedom," backed by Blair Cunningham behind the drums, Giles Palmer on guitar and Luke Judy on keyboards. No one plays the bass! 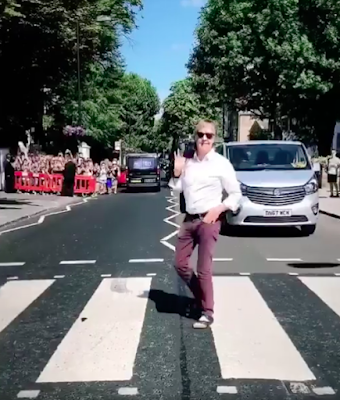 It has been speculated that Paul published this video as a comment on the recent visit to Europe by US president Donald Trump, a controversial visit which has been getting a lot of media attention. Then again, it could be Paul honouring what would have been Nelson Mandela's 100th birthday. The Magical History Museum - the new Beatles museum in Liverpool. 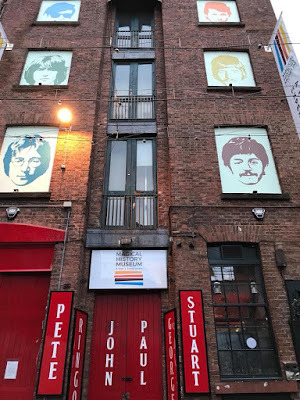 Friday is opening day for Liverpool's new Beatles museum "Magical History Museum", owned by the Best brothers - Roag and Pete. There have been mixed reactions to the focus two earlier group members have been given on the fasade, Pete Best and Stuart Sutcliffe were members of the group when they were only locally known, in Liverpool and Hamburg. 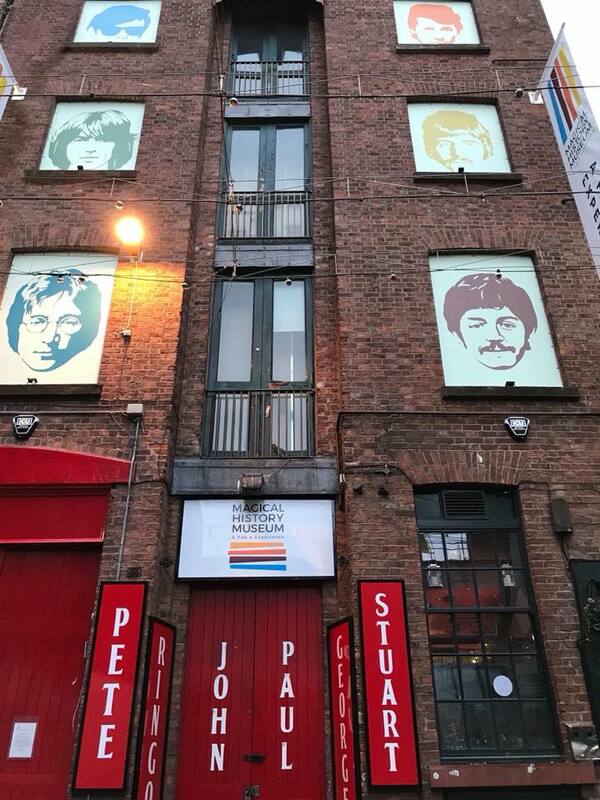 The museum is smack in the middle of Beatleland, Liverpool - in Mathew Street, which is also where the Cavern Club, the Cavern Pub, the Beatles shop and the pub "The Grapes" are located, and right around the corner for the Hard Day's Night hotel. You can listen to a telephone interview with Roag Best about the new museum here. French promo CD for Paul McCartney's song "Come On To Me"
Eager CD collectors have informed us of the availability of promotional or radio promo CDs of Paul McCartney's two new songs. Apparently French releases, these were bought by one collector through ebay. The two CD's contain one song each, but in two versions: regular and (shorter) radio edits. So, listen out for those radio edits! French promotional CD for Paul McCartney's song, "I Don't Know". Remember this cartoon? It has been around since 2014. That final panel was recently updated to say 2018. 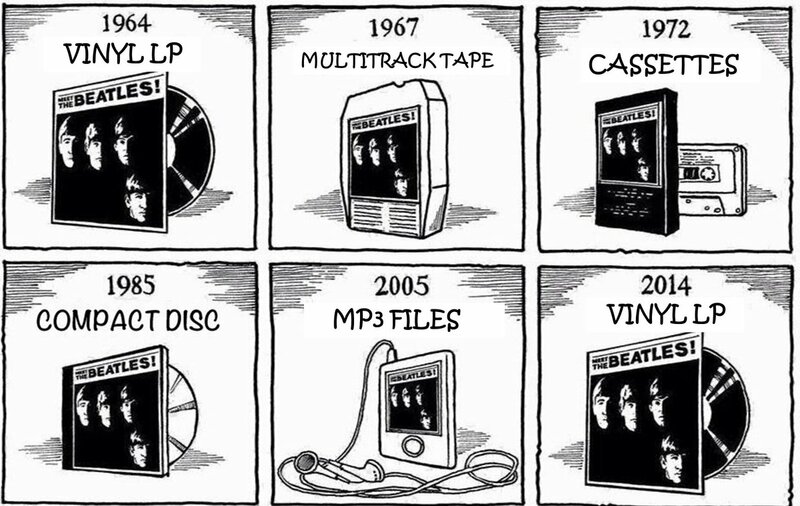 This cartoon has been floating around on social media since 2014 at least, and is a satirical statement on the vinyl revival, at the same time telling the story of the development of mainstream audio carriers. 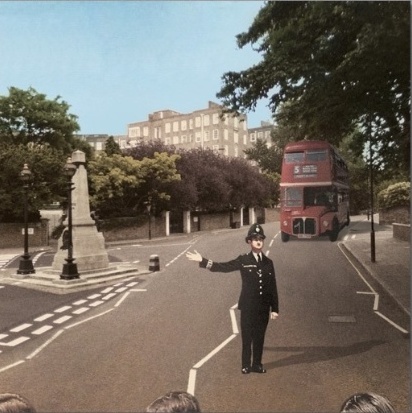 The artist has chosen the iconic "Meet The Beatles" to illustrate his point. 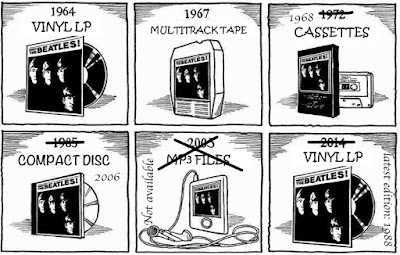 Still, as a Beatles fan I have always tried to make corrections whenever false information has been published. I have resisted commenting on this cartoon for years, but I finally gave in. 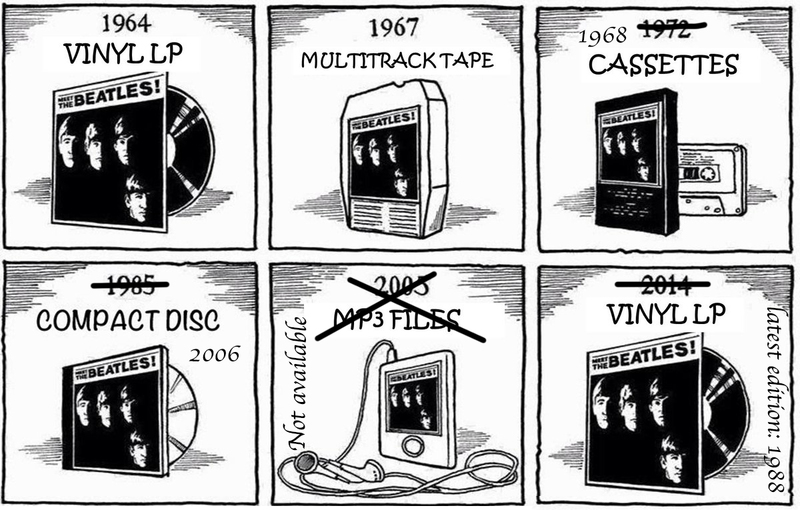 The real publication years for the various editions of the "Meet The Beatles" album wouldn't have illustrated the development of mainstream audio carriers well enough. Basically because when The Beatles' official CDs were going on release back in 1987, the British editions were the only ones deemed good enough, so the US "Meet The Beatles" wasn't released until 2006 - when the record company felt a need to further milk the market without offering anything really new. 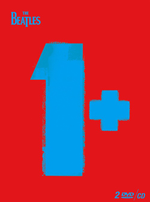 This US album was never released as mp3-files in an official capacity, as the streaming files and other digital releases have been concentrating on the British albums. There was no vinyl edition of "Meet The Beatles" in 2014, and the 75th anniversary edition listed in 2016 by Capitol Records as a future release hasn't materialised yet, so the most recent vinyl edition is from 1988. Finally, I wanted to add reel-to-reel tapes to the collection. 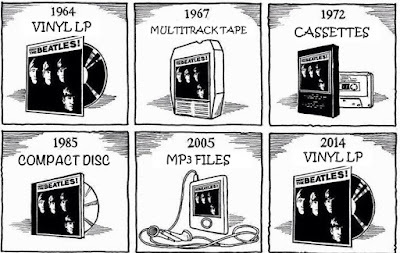 Please note, there were no mini-disc, digital compact cassette or DAT tapes of "Meet The Beatles", but then again those formats never took off. Was it really the 8th of August 1969? A few days ago, I was contacted by one Richard Heath, a man who was Iain Macmillan's printer from the mid eighties and until the photographer passed away in 2006. Heath was eager to correct some of the information I provided on my Abbey Road Photoshoot page. 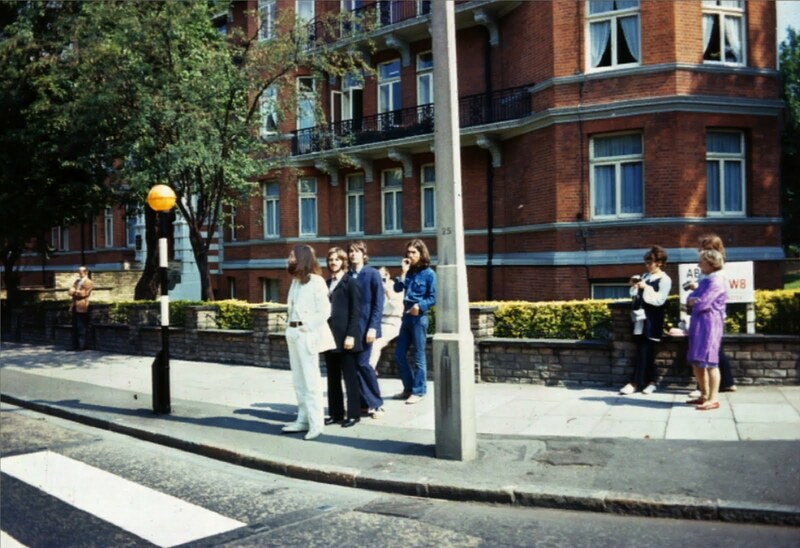 The first issue is the actual date when The Beatles were photographed crossing the Abbey Road. 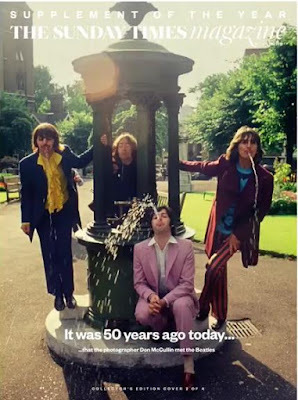 It has been generally accepted that this happened on the 8th of August, 1969. That makes it a Friday. However, people seem to remember the shoot having taken place on a Sunday! Iain seems to have always remembered it to have been a Sunday. Here's what Heath wrote: "Now on one of the many conversations I had with Iain, and once you got him started he was off, I'm sure he said it was on a Sunday. So to be honest it may not even have been the 8th., I really don't know.". Also, Kevin Harrington wrote about it as a Sunday in his 2015 book. 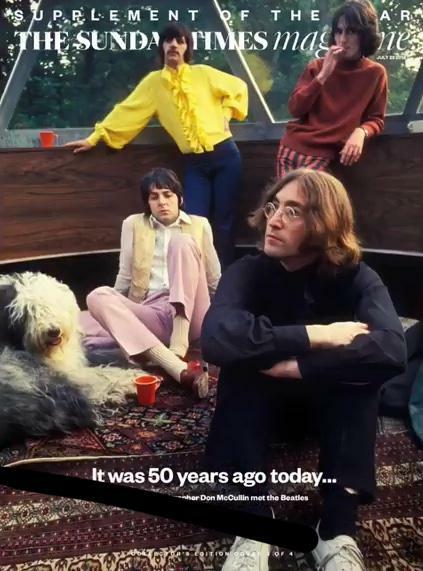 He remembers having been picked out to do a "dry run" for the photo the previous Sunday, and The Beatles were photographed the next Sunday. So if the Sunday reporting is true, the photo may have been taken on Sunday the 10th or perhaps even Sunday the 17th. A policeman held up the traffic during the photo shoot. Or, so they say anyway! Another issue Heath was keen to pursue was the shutter speed and exposure time. Macmillan used a Hasselblad camera with a 50mm wide-angle lens, aperture f22, at 1/500 seconds. Or at least, that's what was reported earlier - but again in comes Richard Heath with some corrections: "Regarding the camera exposure: Back in those days film speed was not all that fast, maybe 64-100 ASA which I would be amazed if that gave you a setting of f22 and 1/500th of a second. I would think it would be 2 or 3 stops down from there, maybe f11/f16 at 1/250th, even 1/125th of a second. ... Strangely the rear shot of the wall/girl was shot on a different film (but) both front and rear films were Kodak, as most transparency film was in those days. " The setting of f22 at 1/500 seconds have also been disputed by a commentator over at The Beatles Bible in 2016: "As a professional photographer for the past 45 years I can tell you with certainty that this photo was not taken at 1/500 at f22.on transparency film. Even the most sensitive transparency film of the era, Kodak high speed Ektachrome, would have been three stops under-exposed at that setting." The photo of the back cover was shot using a different type of film. 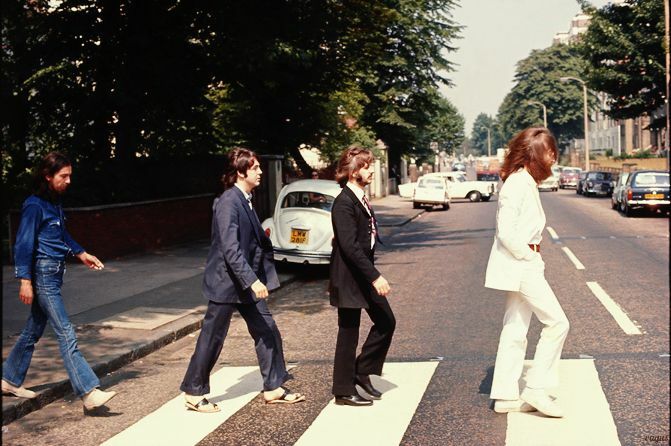 The original photo that made the cover of "Abbey Road" may have been lost, and it's likely that the only original negatives remaining, are the outtake photos. 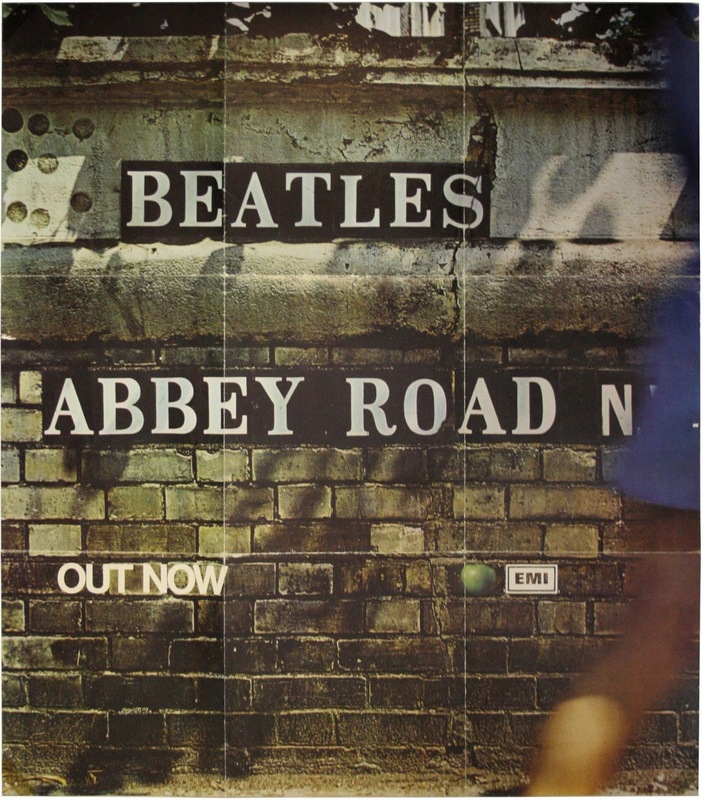 Richard Heath: "Believe it or not but back in those days it was quite common to send an original to the blockmakers, ie for an album cover - even a Beatles one, and never see it again. Exactly that happened in this case. I started making prints for Iain in the mid 80's and I have never seen the original transparency, when I asked him about it he just said he never saw it again." "When I started printing them you could only buy Kodak "R" type paper, and it was always a problem to get an accurate print. Basically because the Kodak paper was not very good. It was almost impossible to John's white suit to look natural, the contrast just wouldn't allow you to get detail in it. In fact, I can remember having a heated conversation with Iain in which I ended up suggesting, very politely, maybe he might be better if he used another laboratory, but he absolutely wouldn't hear of it". "Then we started to get Fuji paper. OMG! This stuff was amazing, the colour, and contrast was from a different galaxy. Needless to say Iain loved it. So if you look on the back of the very early prints and it says Kodak, and other ones say Fuji, that's why they can be so different in colour with the Fuji versions being much richer and accurate in colour". "The watermark (is) a very faint printed name of the paper producer. To complicate things a little, Fuji didn't always print their name on the back, it depended on what size of paper you were using. Just for the record, they were never printed on "C" type paper from the originals. The only ones made on that paper would have been made from digital files. Negatives were never made from the originals, not by me anyway". I hope this is valuable information for all you photo collectors out there. Save for the photo paper information, the other subjects of the discussion have been incorporated into the main Abbey Road Photoshoot page. Some of you may have noticed a discrepancy in the "Ticket To Ride" segment in The Beatles' "Help!" movie. 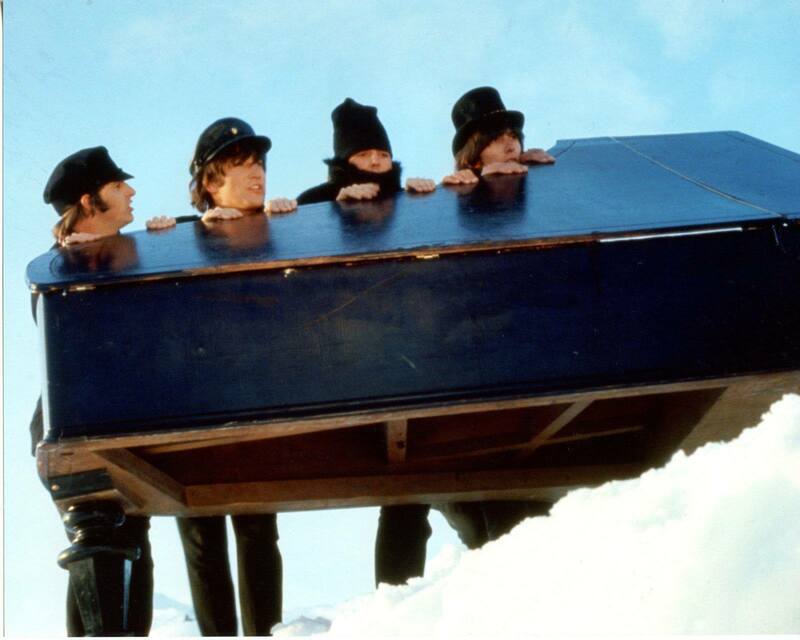 In the scenes around the piano, there seems to be an extra hand. 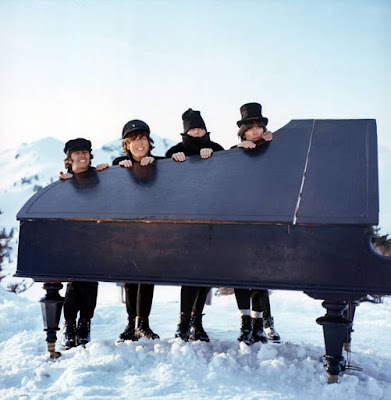 Then there was this still photo, which seemed to contain an extra foot, because George didn't normally sport three feet? 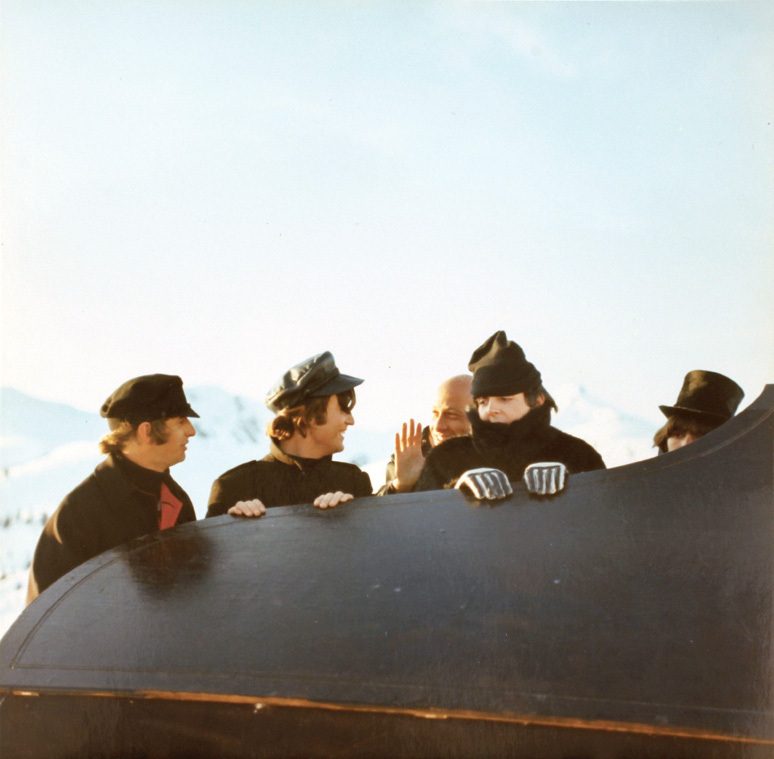 This photo shows that Richard Lester may be the one lending The Beatles' an extra hand. We discovered it at Gotta Have Rock and Roll's Rock & Roll Pop Culture Auction. 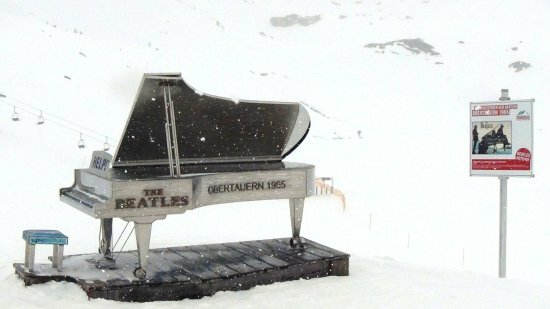 Incredibly, at the location in Obertauern, Austria, a piano sculpture has been installed to commemorate this movie scene. This and other installations were unveiled in March 2015, fifty years after the filming. The first restoration of "Yellow Submarine" was done in 1999, when the film cells were painstakingly restored, faded colours recoloured, the sound was stereo remixed and the first surround sound mix was made. 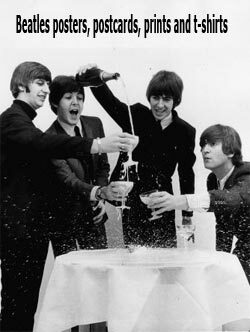 The three remaining Beatles were interviewed for the re-release (on DVD and VHS), resulting in several EPKs (Electronic Press Kits) distributed to TV stations. VH-1 made a TV programme from these EPKs. In 2018, The Beatles' official YouTube channel have released short clips from these 1999 interviews, but here is the VH-1 Special. Yellow Submarine Songtrack EPK - Paul, George and Ringo chat about the new mixes of 'Yellow Submarine', 'Hey Bulldog', 'Eleanor Rigby', 'Love You To' and 'All You Need Is Love'. Also five preview clips from the upcoming DVD: All You Need Is Love, Meanies Attack, Hey Bulldog, Sea of Monsters & Sea of Holes. Also includes 44 second Mod Odyssey clip and a preview of the packaging for the upcoming releases. Yellow Submarine Returns EPK - Paul, George and Ringo chat about the renovation of the sounds and pictures, Blue Meanies, their animated portrayals and the songs. Also includes 44 second Mod Odyssey clip and a preview of the packaging for the upcoming releases. 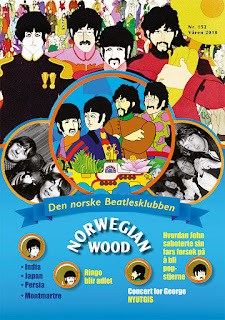 The Yellow Submarine Collection EPK - 2:30 clip regarding the merchandising tie-ins. For Kids Of All Ages EPK - 3 minute film featuring the reaction to the film of some Liverpool school kids and further interview footage with Paul, George and Ringo. The EPKs were originally distributed on video cassettes, but are available on a bootleg DVD from the Yellow Cow label,"Yellow Submarine, The Complete 1999 EPKs" Total time: 34:26, but some footage is repeated on several of the EPKs. Yesterday, The official Beatles YouTube channel uploaded the 1999 special stereo remixed "Yellow Submarine Songtrack" as a playlist. If you haven't heard these remixes, now is the time to get that headset on and hit play! 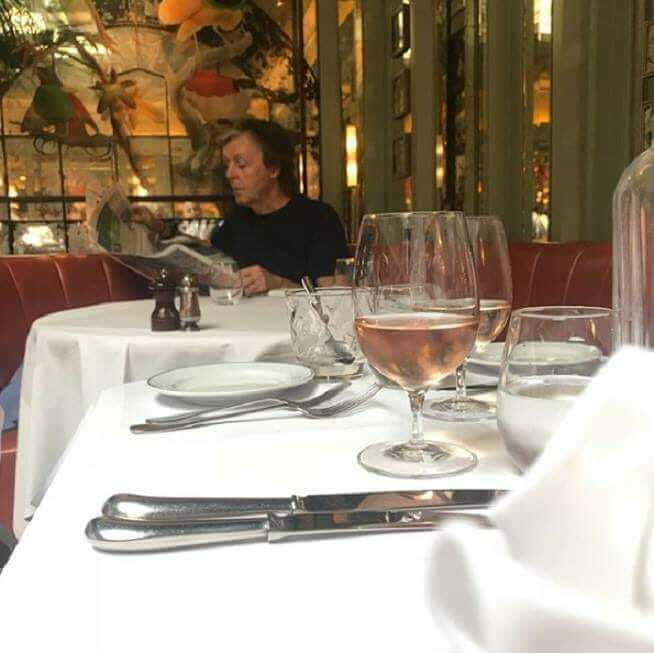 Paul McCartney relaxes in a St John's Wood restaurant. Hot on the heels of having announced four concerts in Canada, Paul McCartney revealed that he is coming to the UK to do three gigs in December: Liverpool, Glasgow and London. See his announcement here. The venue in Liverpool, Echo Arena, dropped lots of hints about Paul's return to the city through their Twitter account yesterday. Tickets go on sale Monday 16th July at 10am. An American Express® presale will run from 10am on Wednesday 11th July until 10pm on Friday 13th July for all American Express Cardmembers. T&Cs apply. Also, fans registered at PaulMcCartney.com will have access to the presale. The gigs are part of his "Freshen Up!" tour. "Up and Coming" became "On The Run" became "Out There" became "One on One" has become "Freshen Up"! So that means new stage clothes for Paul, a new programme and tour merchandise, a slight change to the pre-show film and perhaps new curtains. 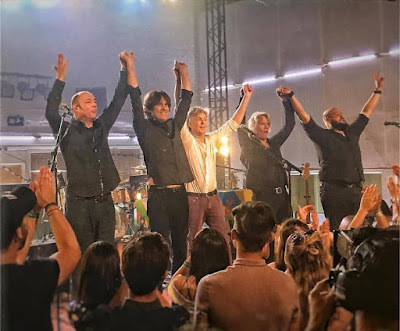 In other, McCartney-related news, record producer Greg Kurstin was interviewed quite extensively by Rolling Stone magazine about Paul's new album, "Egypt Station". You can read that interview here. 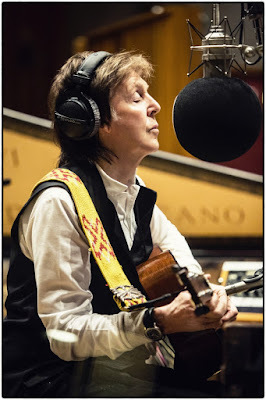 It appears that the first track the pair worked on was not for this project but for Paul's upcoming - but still in the works - cartoon, "High in the Clouds", which we have reported about earlier. In fact, we mentioned the plans for this animated feature as early as in 2010, and then again in 2013. Then, three years ago, McCartney reportedly duetted with Lady Gaga on one of the songs for the film. During the phone interview, Kurstin mentioned a few song titles which haven't been revealed before: "Confidante", "Hunt" or "Hunt You Down" and "Back in Brazil". 20-something songs were recorded with Kurstin. The title "For You" is mentioned as produced by Ryan Tedder, but that was probably a bad phone line or a misheard title, as that track has been mentioned earlier, as "Fuh You". Before this, we knew about these titles: The instrumentals "Station 1" and "Station 2" bookend the album, "Happy With You", "People Want Peace", "Despite Repeated Warnings" and of course the single: "Come On To Me" and "I Don't Know". From recording sessions for "Egypt Station", Pauls upcoming album. The EU-parliament has received a letter from Paul McCartney (who just announced his new tour - beginning with four dates in Canada in September) today. The issue at hand is really about YouTube, a website which - despite it's popularity - hardly creates any revenue at all for composers or artists, because of outdated legislations from the previous century. This has been a hot potato in the record industry for years. 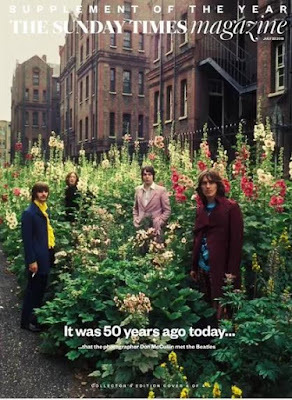 It's quite possible that this is the reason why, in the past few weeks, The Beatles have uploaded nearly all their albums to their YouTube channel, for free of charge playing - just to illustrate this point. 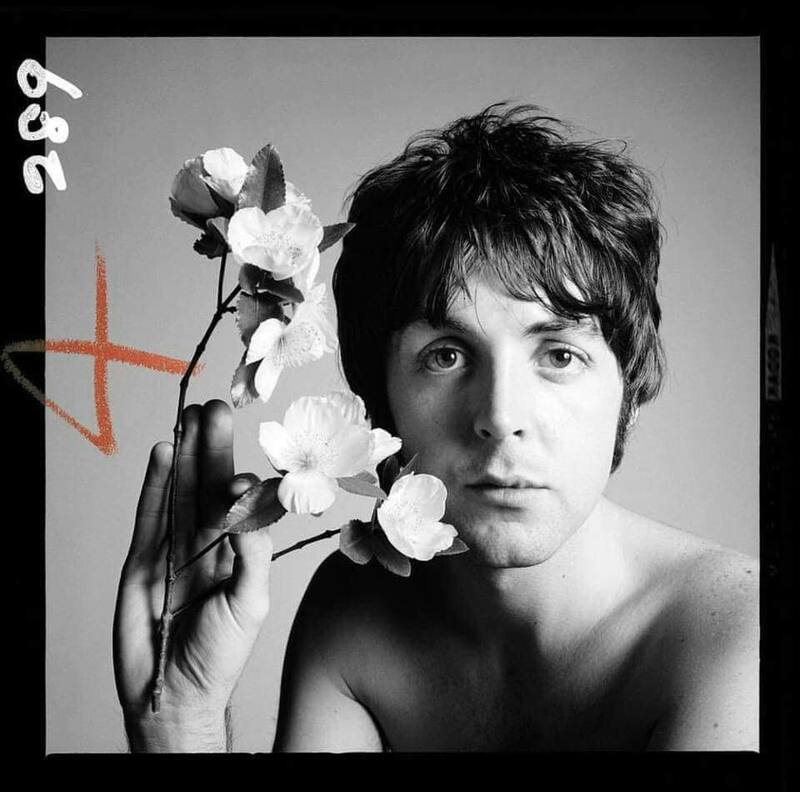 Paul McCartney by Richard Avedon. 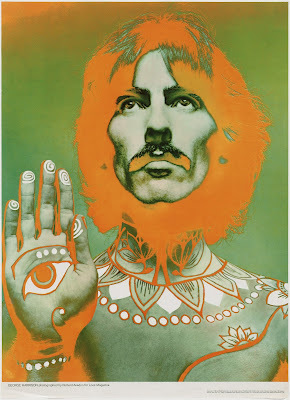 May 29, 2018, the original portrait of Paul McCartney that Richard Avedon used to create his "psychedelic" posters from, appeared online on social media. This was the first time I had ever seen the original photo. 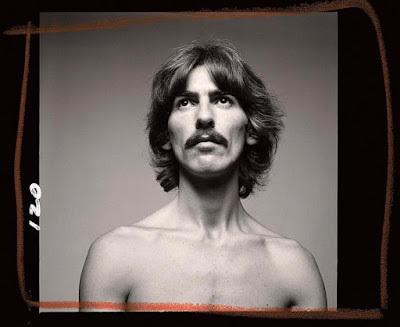 And June 22, what appears to be the original George Harrison portrait was posted. It looks like these originals have been published by the Richard Avedon Foundation on various social media, including Instagram. We are grateful for that, because it is nice to finally see these as they were before the solarisation process. On the finished version, a hand was included, possibly pasted into the photo. 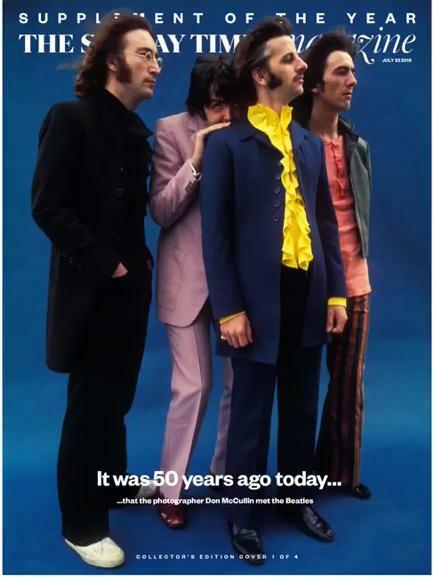 The Beatles were photographed by Richard Avedon on August 11, 1967 in the photographic studio in Thompson House, 200 Gray's Inn Road, London. Avedon, whose career spanned 60 years, died in 2004 at the age of 81 while on assignment in Texas for The New Yorker. 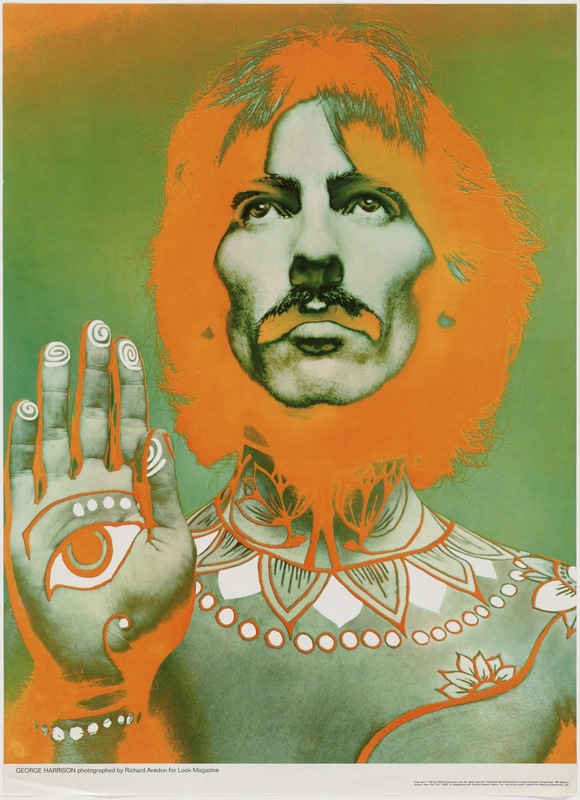 You can read about Avedon's Beatles portraits and posters here.